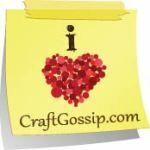 I just stumbled accross yor blog from craftsy.com. I LOVE it! I'm so excited to see more from you! Keep the patterns coming! SUPER CUTE! I love this pattern, but will knit it if I knew what size the needles are?? Did you use size in MM., US, or imperial?? Thanks..
Great pattern and very quick to knit. I did the hat minus the bib in less than two hours. I'm going bib-less until I figure out how to pick up stitches. Thanks for sharing. @Debbie I used US15 16" circulars.